EDEN PM is "the best sleep aid for insomnia according to Kevin Trudeau's new book More Natural "Cures" Revealed, the uncensored follow up to his No. 1 New York Times Best Seller, Natural Cures They Do Not Want You To Know About "
Insomnia is Deadly! Research is proving that insomnia and poor quality sleep is associated with many disease states such as cancer, diabetes, obesity and heart disease. Your body needs good sleep: EDEN PM, the original version of our sleep formulas, gives you Great, Restful Sleep! You need good restful sleep. Good sleep has been shown to reduce stress levels and elevate mood. Depression, anxiety and fatigue may be dramatically reduced by deep restful sleep. Deep sleep also increases your body's release of melatonin and growth hormone (GH) - two anti-aging hormones. Growth hormone also burns fat and builds muscle, helping you look and feel your best. Melatonin is a powerful anti-oxidant, and has protective effects against cancer! You will love the results of our Original Formula! This all natural sleep aid is safe, 100% natural and available without a prescription. 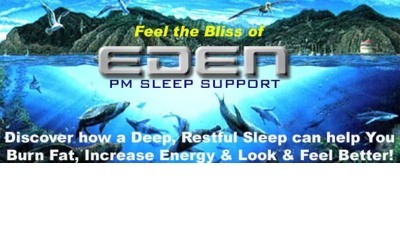 EDEN PM is an all natural sleep aid, non-addictive and free from side effects. End Insomnia Today and Feel Better Now! Experience the wellbeing that only a restful night of sleep can give you. Feel energized, feel alive and above all feel safe knowing that EDEN PM is completely safe, all natural and non-addictive. Order today and get rid of insomnia.